Twelve-year-old Princess Sabina of Milan is visiting her grandmother over the summer in the Italian city of Asti. On her way to the park, she reaches a clump of tress. Who should she spy but bad boy Marcus, also twelve, who is swinging from the top of a young tree by rocking its thin trunk back and forth. On a dare, Sabina joins him on the next tree. They swing a few minutes then stop and have a lively debate about girl-boy relationships. So starts their secret eight-year romance. The year is A.D. 394 and times are dire for the Roman Empire, besieged by barbarians from the north and racked by treacheries from within. 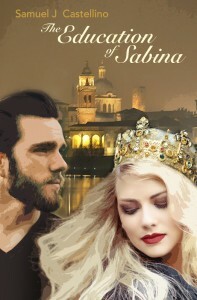 A good marriage for Sabina would solidify the safety of her people. To ensure this, her parents send her to Athens then Constantinople to get the best education and exposure possible. One potential husband who is completely unacceptable to Sabina is Prince Lucius. Though he is her nemesis, he desires Sabina for her personhood and inheritance. 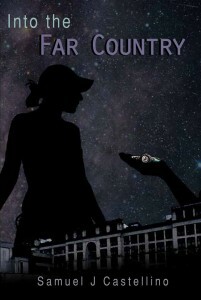 After each stay abroad, Sabina returns home, and she and Marcus pick up where they left off. Her five years overseas have educated her in rhetoric, languages, and politics. Marcus has been educating her in something else. In time, their clandestine love affair comes to an end. Marcus is shipped off to Germania as a soldier in the Roman legion, and Sabina is assigned to Ctesiphon, the capital of the Persian Empire. They are now three thousand miles apart and there is no way they can be together. Or is there? The Education of Sabina tells the tale of how Sabina encounters both Lucius and Marcus again in a confrontation in Asti in A.D. 402. At seventeen, Marine Sergeant Klarissa Morey is emotionally dead inside. Years of fighting at the front have taken their toll on her. But the war has ended, and her people have found a new world: Earth. They decide to send a scout, and select her. Into the Far Country is about Klarissa’s journey to feel again—a journey that begins at home as she prepares to travel to earth under the guise of a foreign exchange student from Portugal. She studies American pop culture, and the music and films stir emotions and longing within her. Her journey accelerates when she arrives in America and meets Sophia, Emma, and Issy. She quickly bonds with them and feels the happiness that comes with having true friends. Shopping for clothes, talking about boys, learning about each other’s interests as they progress through their senior year in school—she loves it all. And there is more happiness in store for her when she meets Ethan. He goes from rescuing her from a bully on her first day of school—not that she needed rescuing!—to becoming the love of her life, her “first time,” the one she abandons herself to completely. Throughout it all, Klarissa has an ongoing sense of foreboding. She knows there is no stopping the coming invasion from her own people. Earthlings were doomed the first day they were discovered. There is nothing she can do. Or is there? The Prodigal Son is a parable about a father and his two sons. The younger son, who made an exit and return to the family homestead, has just arrived home. The elder son, upon confronting his father about the celebration to follow, is told, it seems for the first time, that he is to inherit everything his father has. “Don’t you know? Everything I have is yours,” says the father to his son. The Prodigal Son Revisited is a mix of short stories and academic research. 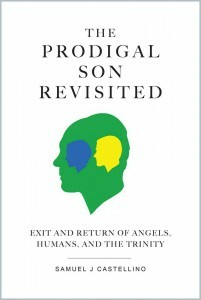 It is a cosmic view of the original story that proposes the elder son, younger son, and father can be seen as stand-ins for angels, humans, and the Trinity, and who, like the younger son in the Prodigal Son, go through their own exit and return and achieve their own inheritance as a consequence. What is their exit and return? What is their inheritance? What is the relationship among the three to make all this happen? That is the subject matter of the book. The book is anchored at the front end by the theology of Saint Gregory of Nyssa (d. 390), and at the back end by the theology of Dom Virgil Michel, O.S.B. (d. 1938). The book’s core circles around Catholic moral theology and a modern understanding of the Sacraments, especially the Eucharist. Any writings not referenced by footnotes are the author’s own speculations and musings on the subject material. The short stories are set-up pieces to the academic research and are also used as fictionalized accounts on how we can see the theology of Gregory of Nyssa and Virgil Michel in action in the modern world.